The iliopsoas muscle is part of the pelvic muscles and is located near the leg. The trunk and leg are connected by the iliopsoas muscle. It is divided into two muscles: the psoas major and the iliacus muscle. The iliopsoas muscle covers a large area that includes the groin, abdomen, thorax, and first four lumbar vertebrae. 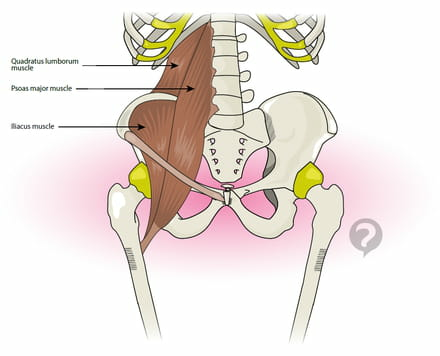 The iliopsoas muscle enables the rotation and bending of the trunk and hips. Published by christelle.b. Latest update on August 20, 2014 at 05:48 AM by christelle.b. This document, titled "Iliopsoas muscle," is available under the Creative Commons license. Any copy, reuse, or modification of the content should be sufficiently credited to CCM Health (health.ccm.net).